Dean James got his first piece of precision equipment, a yield monitor for the farm’s combine, in 1998. It paid for itself in two years by quantifying how much yield was lost due to edge effect in tree-lined fields. Planting a buffer strip of grass along the trees increased his per-acre yield and allowed him to take advantage of conservation programs. 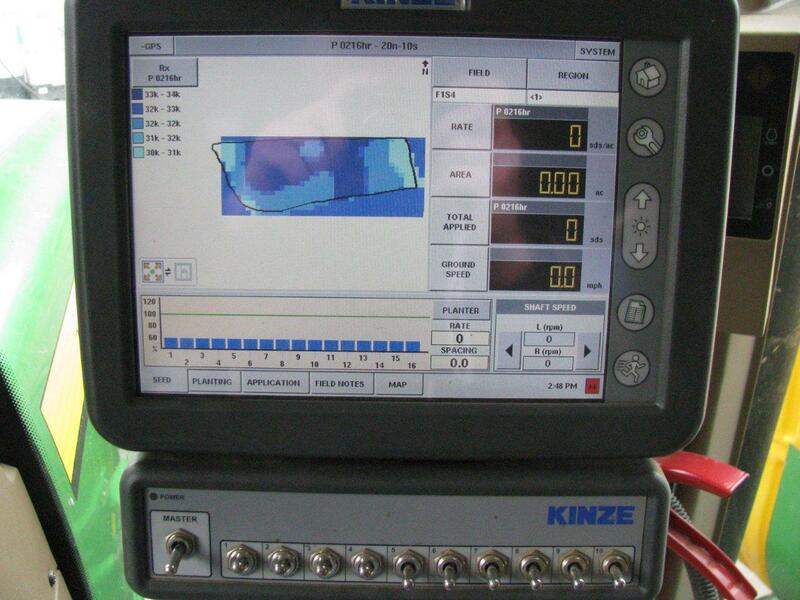 From there he started tracking yield data to determine management zones throughout fields. “We were able to identify shallow soils not capable of retaining water and deeper soils where moisture was more available and yields were higher,” he says. In 2011, James used data gathered from his John Deere Greenstar system used on his combine and John Deere 4730 self-propelled sprayer to vary seed populations by management zone. He used EASi Suite MapShots software to create the prescription map and an Ag Leader controller to operate his 40-foot Kinze 3660 planter equipped with variable rate seeding, row clutches and fertilizer shutoffs. In addition to soil testing, tissue testing and basal-stalk nitrate testing, he uses a SPAD chlorophyll meter to evaluate his growing crop and dial in sidedress nitrogen applications in corn. Applying just the right amount of fertility is essential for efficiency, profitability and because the farm is in the Chesapeake Bay watershed. As he continues to carefully monitor fertility and reach for higher yield, James hopes to also variable rate fertilizer and nitrogen. All of these goals require collecting and analyzing significant amounts of data. And working with that data hasn’t been an easy task. Using John Deere GreenStar technology in the combine and sprayer and Ag Leader for planting required James to use a third party system to convert his data to a useable form. 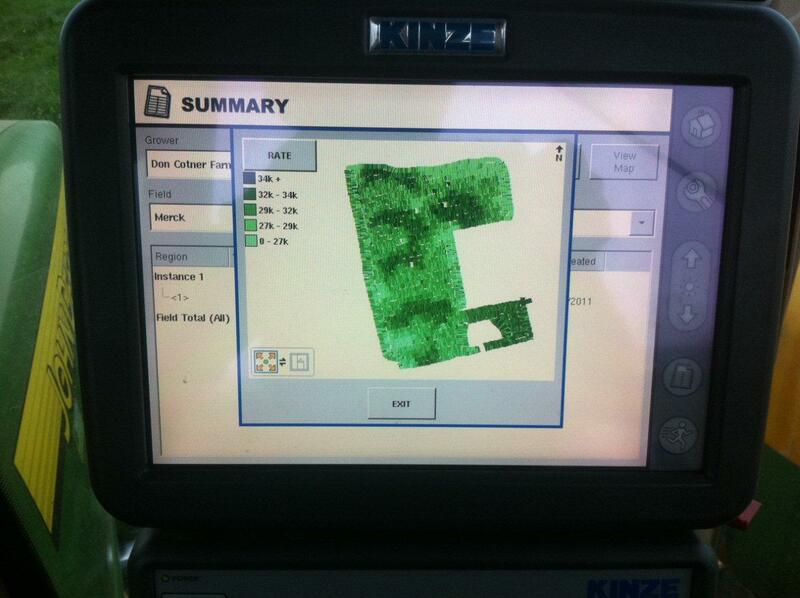 Dean James’ agronomist has to mash data through multiple software programs to make data collected from a GreenStar system useable as a prescription seeding map for his Ag Leader-operated Kinze planter. The simple solution would be to pick one system and stick with it, but that doesn’t cut it for James. “Each system and software package has its advantages and I want to choose the combination of technologies that works for me. And I want to be able to exchange data between those systems without having to change the format,” he says. James would be lost without his crop scout/agronomist. He is responsible for shuffling data and formatting it so the information pulled from the yield monitors can be used and combined with other data to make prescription maps readable by his planter system. “He brings the data in, creates a prescription map with EASi Suite, exports it to something else and then formats and brings it back into his Apex program and then creates a file useable by the equipment. It’s a mess,” he says. James chose MapShot as a third party interpreter because it offers profit maps and other features he wants. But mostly he chose it because it was a program that could speak to multiple technologies and get the data to come in like it should. In the long run, he wants to not be limited in his software and precision technology options. “They have to make it so there is a standard format for data files that can be manipulated by all technologies and software. It’s creating a management headache and limits our abilities to use the technology that works best for us,” he says. James is further concerned that equipment manufacturers such as John Deere are transferring tech support responsibility to dealerships.